Growth of massive reeds, or phragmites, in the Back Bay Fens is known to present several public safety and health hazards. The reeds create hidden and obscured areas, providing a venue for illicit activity, and are also known to present a fire hazard. Constituents and community groups, especially those involved with the Victory Gardens, have often voiced their frustration at these problems. 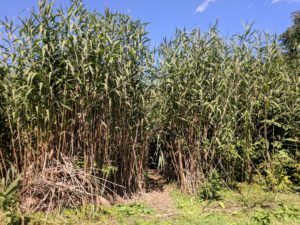 Phragmites is often considered an “invasive species” which is prone to rapidly reproduce, and there is some debate over the extent to which its proliferation may be harmful to native species. The phragmites between the Muddy River and the Victory Gardens, estimated to be about 15 feet high. A path carved out through the reeds. Fires affecting the phragmites in the Fens are relatively common; the most recent one was in 2016. 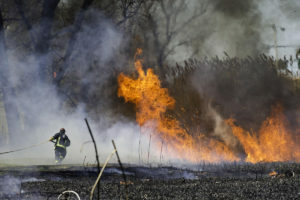 Although fire does have the effect of controlling the spread of the reeds, it is clearly not preferable over safer alternatives for their control. 2016 fire in the Fens; photo courtesy of the Boston Herald. The BCC approved an investigation of these three methods. However, upon subsequent review by the Massachusetts Department of Environmental Protection (MassDEP), the areas within which reed control was allowed were vastly reduced, and limited to only the “Northern Basin” area. In 1998, a Vegetation Monitoring Report was prepared which determined that option 1, mowing the reeds, was preferable to the other two options. Black plastic was found to be ineffective at limiting their growth, and use of herbicides carries an additional risk of incidental environmental harm. In 2005, the BPRD successfully applied to mow the reeds in “buffer zone” and “land subject to flooding” areas. Over three years this program transitioned these upland areas from containing phragmites to containing more typical grasses and vegetation. Phragmites is unusual in an upland area, and its removal was relatively intensive. The area subject to the 2005 permit is now a standard mixed turf that is sustained through regular maintenance like the rest of the park. Regular maintenance does not require any additional permitting. In October 2009, representatives of BPRD, the Boston Police Department, and the BCC met with then-City Councilor Michael Ross, representatives of the Fenway Civic Association and Fenway Garden Society, and staff members from then-Senator Tolman, Senator Chang Diaz, and Representative Rushing’s offices to discuss the Fens. In particular, the community representatives asked for more aggressive management of the reeds. In 2010, the BPRD applied to the BCC for a wetlands permit to mow phragmites in the northeast portion of the Fens, nearest to the Victory Gardens. The mowing would only have happened temporarily, until the completion of the Muddy River Restoration Project. A brush fire in the Fens that year helped garner community support for this application. Each wetland resource area is presumed to be crucial to a variety of interests, including: public or private water supply, ground water supply, flood control, storm damage prevention, prevention of pollution, protection of fisheries, and wildlife habitat. Applicants must show that the proposed alterations do not have an adverse effect on these interests. For example, the Muddy River is not used for public or private water supply, and so it is straightforward to argue that any proposed alterations will not adversely affect this component of wetland resources. Clearly the proposed alterations exceeded the thresholds. However, the BPRD proposal did argue that mowing phragmites would not have an adverse effect on wildlife, including in the application an analysis of phragmites’ inability to provide wetland habitat, its tendency to create a “monospecific” (one species) area because of its dominance over other grasses, its low potential to serve as a food source for wildlife, and its tendency to use up water and minerals in the soil. Alteration of bordering vegetated wetlands is presumed to be significant to the various interests listed above. Unlike the other resource areas, there is not a threshold below which alterations are assumed not to affect wildlife habitat. Up to 5,000 square feet of bordering vegetated wetland can be removed if it is adequately replaced; up to 500 square feet of resource loss may be permitted without replacement. The 2010 proposal included altering 5,400 square feet of bordering vegetated wetland, with no replacement suggested. The BPRD did argue that while this much bordering vegetated wetland would be altered, the regulations do not explicitly prohibit such work without replacement unless bordering vegetated wetland is lost. The final resource area, riverfront area, generally includes coastal banks, salt marshes, bordering vegetated wetland, and land subject to flooding. The regulations state that the proposed work must meet the performance standards of each of these resources areas contained within the riverfront area, and that there must not be a feasible alternative to the proposal. The 2010 application used the investigation of other control methods from 1995 to argue that there was no viable alternative to mowing the phragmites. The BCC denied the application for mowing based on the alteration of 5,400 square feet of bordering vegetated wetland proposed without replacement. 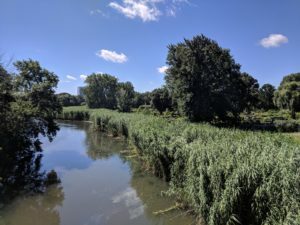 Further, the BCC agreed with the BPRD that mowing, as opposed to other forms of phragmites control, was the preferred alternative, and that there are health and safety concerns (fire hazard and limited visibility) associated with the reeds. The BPRD Director of Historic Parks informed us that a full project including the required replacement of the wetland resources is simply too expensive to be practical, estimating it would cost tens of millions of dollars. They had at one point hoped to accomplish the work through a partnership with the Army Corps of Engineers but the federal government declined to fund the restoration in large part because of its high cost. The BCC’s denial of the application to mow the reeds was affirmed by MassDEP in a Superseding Order of Conditions. MassDEP’s denial notes only that the alterations proposed exceed the regulatory thresholds, and so cannot be permitted. In 2018, the BPRD applied to the BCC for an Emergency Certification that would allow them to clean up debris in the reeds through a company called Clean Harbors. The BCC approved the application for operations in June and July. Materials would be collected with shovels, rakes, and wheelbarrows and be removed for proper disposal. The BCC stipulated several “special conditions” of the cleanup, including that fish and water quality be protected, and that proper precautions be taken to ensure that fuels or other pollutants were not spilled. The cleanup certification includes all of the areas involved in the 2010 mowing application, as well as phragmites on the other side of the Muddy River (to the south and east of the river). Besides those initiated by the Parks Department, other efforts are continuously underway to ensure that the Fens are safe. The Boston Police Department, as well as the Boston Park Rangers, patrol the area and respond to calls, and several city agencies provide services to address homelessness and substance abuse in the area. Residents are encouraged to call 311 to report any non-emergency activities (such as the presence of trash or syringes), and to call 911 in an emergency (such as if someone is injured). While there are currently no pending applications to permit further efforts to manage the phragmites, the BPRD is actively discussing future applications for a long-term strategy. Special thanks to staff at the Department of Environmental Protection, the Boston Parks and Recreation Department, the Boston Police Department, City Councilor Zakim’s office, and Mayor Walsh’s office for their help in compiling the above information. Wow! Aja, this is very impressive and thorough. Having followed the phragmites saga for 30 years plus, it is my understanding that only dredging the weeds from the bottom of the river will really get rid of them. 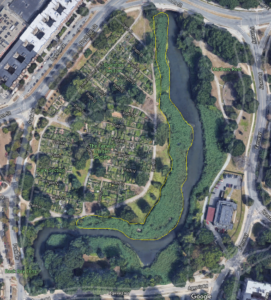 Unfortunately, it is also my understanding that phase 2 of the Muddy River restoration project by the Army Corps of Engineers, which would have dredged the phragmites near the Victory Gardens was not funded and will not go ahead. This is very unfortunate for a number of reasons not just concerning the phragmites, but also Improving the flow of water into the Charles River from the Myddy River. 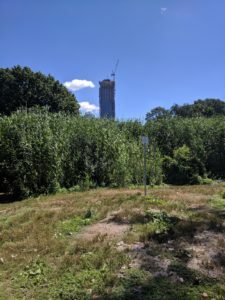 The Emerald Necklace Conservancy could give you more information about phase 2. You folks need to plant weeping willow trees along the banks of the muddy river. would block the sun enough to prevent the necessary light which the phragmites need to grow. It’s an a solution with a one time cost of purchasing, doesn’t hurt the environment. Check it out with environment organizations outside of the Boston Parks Dept. as well as the Boston Parks Dept. My family were farmers from 1903 to 1968. Pesticides are expensive, bad for all living things, and DON’T WORK!!!!!! Good luck with the project. The muddy river is in danger of being completely filled in with phragmites. This is interesting. I am wondering if it would be possible for the public to get permission to mow certain areas themselves.Maybe starting by getting rid of the reeds at the area where they start. If cost is the main problem, maybe the community could be part of the solution. Please find a way to restore the area to Olmstead’s original design. The Fenway, to include the Back Bay Fens, is almost a completely man made community. been narrowed down. You will also note almost no phragmites in the 1959 photo. the Muddy River on the north side will be dredged and phragmites will be removed. Muddy River be cut, if within 3 years they will be removed? That’s it. Good review and report. Much thanks.